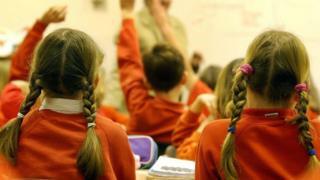 Education for the most vulnerable children in Devon is facing a £4.5m shortfall, the BBC has learned. A letter to county councillors said the shortfall in the "high needs" education budget could be made up by taking money from mainstream schools. The council's letter said the authority "will do everything we can to keep the top slice as low as possible". The council said no final decision had been made. One head teacher said redundancies were possible. The high needs budget is for children with learning difficulties and serious physical disabilities in mainstream and special schools. There are 96,900 children in Devon's schools, of whom 17.1% have high needs funding. The letter to councillors said taking money from mainstream schools was "not a cut to our education spending but a reallocation of scarce resources to help our most vulnerable children". But it added: "This will obviously have an impact on the overall budget of our mainstream schools." The high needs budget takes up about £57m of the overall £507m education budget this year, according to county council figures. The letter came as the local authority was attempting to make efficiency savings with government grants set to fall from £151.6m next year to £102.3m in 2018-19. Jamie Stone, head teacher at Denbury Primary School and vice chair of the Devon Association of Primary Headteachers, said: "It is a concern because we will lose funding which is a very difficult situation. "Maybe we will make redundancies to balance the budget." The Department for Education said it was "committed to making Britain a country that works for everyone, regardless of background or ability". It added that it was "increasing high needs funding next year, as we have this year" and total funding for children and young people with high needs would be more than £5.3bn.